Dr. Meenakshi B Kumar, MD is a Doctor primarily located in Needham Heights, MA, with another office in Boston, MA. She has 21 years of experience. Her specialties include Family Medicine. She speaks English. Dr. Kumar has received 1 award. The overall average patient rating of Dr. Meenakshi B Kumar is Great. Dr. Meenakshi B Kumar has been rated by 6 patients. From those 6 patients 1 of those left a comment along with their rating. The overall rating for Dr. Meenakshi B Kumar is 4.2 of 5.0 stars. We are sorry, it looks like we don't have insurance information. Please call Dr. Meenakshi B Kumar's office for more information. Meena is Board Certified in Family Medicine, did her fellowship in Palliative Care, and is a practicing Reiki Master. She comes to us with seven years' experience as a primary care provider, having served most recently as Medical Director for a health center in Boston. Meena's approach to healthcare is to teach the patient to lead the course of their own treatment through education and empowerment. She sees herself as an advocate for her patients, providing new avenues for care. After receiving her medical degree at MAHE University in India, Meena completed her residency at St. Francis Hospital in Illinois followed by her fellowship in palliative care at Northwestern Hospital in Chicago. A part of the reason that Meena was drawn to Visions was to learn more about Functional and Integrative Medicine - the spirit of which she feels she was already incorporating into her practice through her patient-centered, mind-body approach. Meena's personal interests include her son Neel, photography, reading, singing, and dancing. Meena says that she was attracted to Visions by "the practice and the people," a group with whom she immediately experienced a "connection and honesty" that made her want to be "a part of the mission, not just watching it from afar." Here at Visions we are thrilled to have another member of the team that Meena describes as being totally focused on "comprehensive wellness and full mind-body medicine." To schedule an appointment with Meena Kumar, MD, please call us at 781-431-1333. 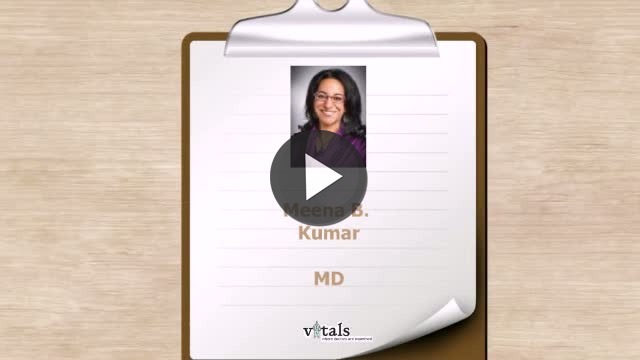 Take a minute to learn about Dr. Meenakshi B Kumar, MD - Family Medicine in Needham Heights, MA, in this video.